So I’ve been a bit quiet this week. I had planned on a foodie Friday post for Friday but never got it done. I came down with a horrid cold and was off work on Thursday and Friday. And it’s not like me to be off work! Yesterday I’ve was feeling a bit more human. I managed to do 3 loads of washing, had a bath – yeah I’ve been ill and stinky! Also caught up with a week and half of Neighbours! And ate a big bar of Dairy Milk! 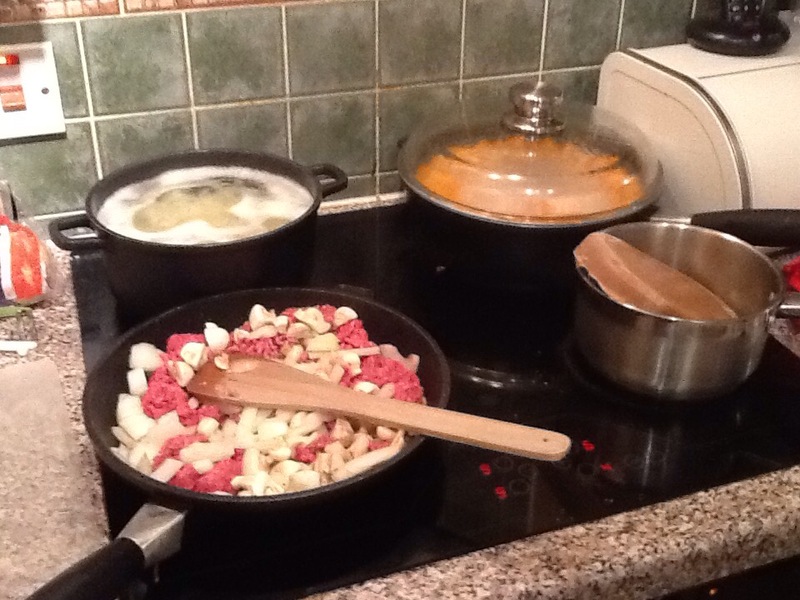 I’ve also been busy cooking…. We’re having mince with onion and mushroom gravy, with mash potato and some crispy potato chips. Also making a vegetable hotspot with chicken – mainly because everything would go off if I didn’t use them. Now my gorgeous little girl has got a cough so no doubt we’re in for a fun couple of days. She’s on Calpol and seems happy enough. She was very irritable on Thursday and if she falls over she’s more “cry-ie” than usual. She’s currently in her cot having a nap. We’ve booked her in to the nursery from January so we’re trying to get her into a routine of settling for naps in a cot because that’s what’s going to happen at nursery. I must admit that I’m slightly nervous about her going to nursery. I’m sure she’ll be fine and it’ll do her good to be with other babies. I’ve booked the 15th and 16th December off work so I can take her there for settling in days. If she’s fine then I’ll leave her to it otherwise I’ll stay there with her for the day. Today we popped out to The Range so I could buy some scrapbook decor. I’m making a scrapbook of Little Miss’ first holiday. In the shop I had a massive sneezing attack and have been lying on the sofa since getting back. So much for me starting to feel better! I hope everyone’s weekend is better than mine! Mmm, I love mince & potatoes! Thanks! I’m much better now – still not quite right but not at all bad compared to last week! Oh and the food was nice even if I do say so myself!